AN AMBITIOUS Larnaca development appears to be one step closer in being implemented with Russian investor Nikolai Potapenko submitting all the required paperwork for the construction of the Larnaca Tower project and voicing optimism that they will be approved. The Russian business tycoon told Phileleftheros newspaper that his plans for the project started in 2011, when Cyprus was struggling to overcome an economic recession. Potapenko also said he has been investing money in Cyprus for several years, referring to another big investment of his company that took place in Pervolia area, the Faros Village. 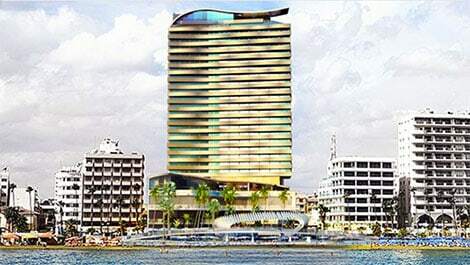 This time, Potapenko is proceeding with a multimillion investment, the Larnaca Tower in the heart of the Larnaca famous seafront, Phinikoudes, which is estimated to cost around €170 million. The new building that will include luxury apartments and offices as well as a 5-star hotel will to take over the space where Hobos restaurant and Lefkaritis parking area are located. The construction of the long-awaited project is expected to begin in April 2019, provided that all required licences are issued in due time. In April the Cyprus Mail reported that amendments to the agreement between Nikolai Potapenko and the Larnaca Municipality had been reached, which concerned revised payment terms for Potapenko’s purchase of a municipal unit on Athens Avenue. The original plans, reported by Politis in February, included the construction of two buildings; one of 11 storeys and the other of 29 storeys. The 11 storey building would be a five-star hotel, with a capacity of 100 rooms. The 29 storey building would comprise 160 luxury apartments, a small mall on the ground floor with 20 stores plus office spaces and underground parking for 440 vehicles.